BROWNSBURG, Ind. 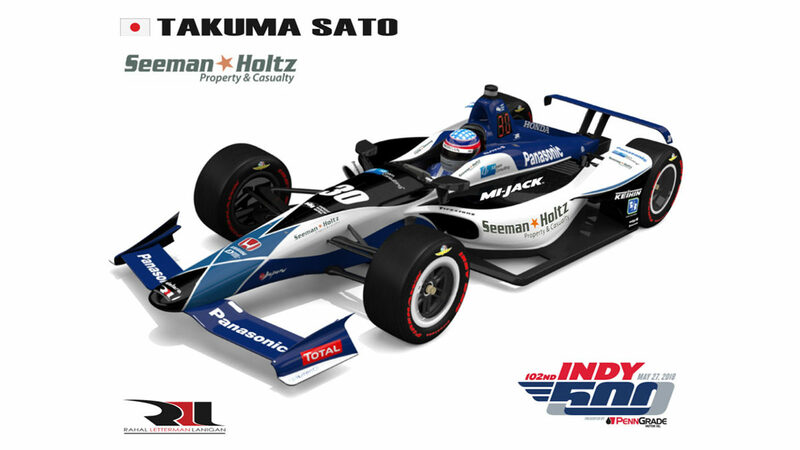 (May 25, 2018) – Rahal Letterman Lanigan Racing (RLL) announced today that Seeman Holtz Property & Casualty, Inc., a leading distributor of insurance, will be an associate sponsor on the No. 30 Mi-Jack / Panasonic entry for reigning Indianapolis 500 champion Takuma Sato for the 102nd Indianapolis 500 on Sunday, May 27. Sato aims to become the first back-to-back winner of the Indy 500 since Helio Castroneves accomplished the feat in 2001-2002. Seeman Holtz branding will be appear on Sato’s race car that will start 16th in the 33-car field as well as on the sleeve of his race suit and in view on the in-car camera. Sato, a native of Tokyo, Japan, has made 140 starts in the IndyCar Series since his rookie season in 2010. His Indy car highlights include wins in the 2017 Indianapolis 500 and the 2013 Toyota Grand Prix of Long Beach – two of the premiere races in the series — and a total of six podium finishes. In addition, he has earned seven Indy car poles and led a total of 471 laps. Prior to joining the IndyCar Series, he competed in 90 Formula One races between 2002-2008 with his highest finish of third at the 2003 United States Grand Prix. The 102nd Indianapolis 500 will be televised live on ABC beginning at 11 AM ET on Sunday, May 27. For more details about the Series, please visit www.indycar.com. The Seeman Holtz family of companies provides comprehensive insurance services to clients across the country. Seeman Holtz Property & Casualty, Inc. continues to target high-quality independent agencies for strategic expansion and continued growth throughout the United States. The company offers homeowner’s policies, automobile insurance, renter’s policies, umbrella coverage, commercial and employee coverage, personal liability coverage, employee benefits and human resources.